I was diagnosed with Acute Leukaemia in April 2015, it was very sudden and I was admitted to hospital one night and didn’t come home after that for the best part of six months. Obviously every situation is different, but things that helped us cope as a family may help others who have just had a cancer diagnosis. There are bleak and overwhelming times when I felt completely hopeless and really couldn’t see an end to my daughter’s devastation, but now I am glad to say she has come out of the other side. Although recently when I was leaving for the hospital to have my bloods checked she was anxious to know that someone would come and get her from school if my cancer had returned, she knows enough about it to know that I would need immediate treatment as an in patient. This has turned out to be a fairly long post but I would ask you to take the time to read it all if you find yourself in a similar position as I was. This is an open and honest account of our experience, what worked and what we tried out. If I’d have found a post such as this I would have felt less anxious about my child’s emotional state. I found it hard to get help and advice as most is aimed at children who have cancer or a sibling who has cancer. While these did help explaining what cancer is and some of the procedures they didn’t give any coping strategies. Unfortunately the NHS referral from her GP meant being passed around as funding is an issue at the moment. 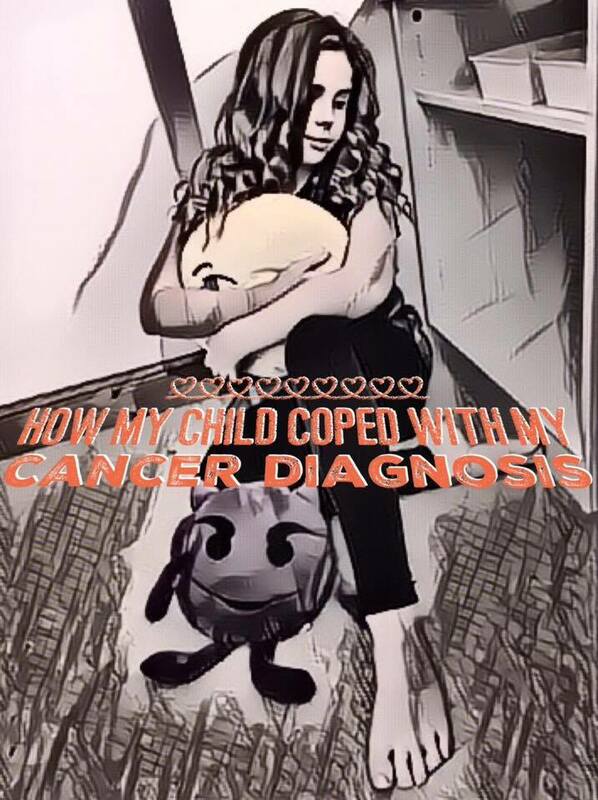 I am working on some tools which I hope to publish online to share what we learnt especially from a child’s point of view…from my daughter to another child who’s parent is going through cancer treatment. This is something I have actually lived through and comes from the heart, not a booklet or healthcare professional. Of course all of these sources have their place, but I believe that nothing helps more than hearing from someone who has actually walked in your shoes. I did listen Macmillan, looked online and read leaflets to give myself some background on where to start helping my daughter to cope. However, I knew my child better than anyone, what would and wouldn’t help us. It’s was the same when she was a baby, I listened to advice but my instincts as a mother often took over. My daughter is bright and doesn’t miss and thing so I knew I wouldn’t be able to hide anything from her. The one time I did she said ‘I knew you were hiding something from me Mummy.’ I found that keeping things from her just made her worry more so being honest was best and talking it through, answering her questions and reassuring her. I have to admit that I was a bit of a coward when I first told my 8 year old about my diagnosis. As she sat by my hospital bed I did tell her I had Leukaemia as I couldn’t bring myself to say the word cancer and I knew she wouldn’t know what Leukaemia was. I’d only known myself a few days so saying it out loud seemed wrong and it was my way of gauging her reaction. She took it really well, I told her that I was very ill but the doctors were doing all they could to make me better. It turned out later though that she hadn’t wanted to cry in front of me as she didn’t want to upset me. My Macmillan nurse did tell me to be honest from the start as children worry more if they don’t know the facts and pick things up from fragments of conversations, she was absolutely right. It was only a few days later that she came back to me telling me that she knew Leukaemia was cancer. Through my treatment it was tough, she cried herself to sleep many times, had to stay and friends and family’s houses over the weeks but still went to school and dance classes. Keeping these things going was important so that she had normality and could forget for a short time. There was one occasion when she was leaving the ward that she did break down and cling to me refusing to leave. It broke my heart and I did wonder if we were doing the right thing letting her visit me, but in time she got used to it and got to know all of the staff on the ward who were brilliant at making us all feel ‘at home’. Once I finished my treatment and had been recovering at home for a few weeks things did start to deteriorate. She’d been so strong most of the time through my treatment that now she knew I was at home and getting better all her built up emotions came pouring out. She didn’t want to be apart from me so getting her to school was hard, she would even follow me around the house. She needed to know where I was going and when I would be back home, sometimes being naughty which I think was to stop me going out. If I showed attention to another child she would get really jealous, another sign of her insecurity. Whenever an advert would come on the television relating to cancer I could see her watching me out of the corner of my eye. Even though these adverts really distressed me I managed to hold it together in front of her. Her reaction made me realise that it was time to face up to what might be going on in her little head. Up to this point we’d decided to let things settle before pushing her to open up. I started by reassuring her that it was alright for her to say whatever she was feeling. Her reply to this was that she’d been hiding her worries because she didn’t want to make me cry…my heart ached to find that she’d been trying to protect me! Mixed emotions of pride that she was such a kind hearted girl and failure that I hadn’t been able to protect her from the harsh realities of life. My first step was reassuring her that she didn’t need to worry about my feelings, that as her Mummy, I needed to help her. I added that I too had someone to talk to about my worries. In the beginning it did open up a can of worms and sometimes I’d be lost for words, but she seemed to accept that I didn’t have all the answers, I have realised that sometimes just about it was enough. She took a book to school so that when she was worrying about anything she could write it in the book then I would look at it and we would talk about it at home. She also had a small white board and would write something on that if she found it too hard to say out loud…one of those things was ‘I’m scared you’re going to die of cancer’… that was hard to see and I had to swallow a lump in my throat! However, this was the moment I knew she trusted me and I would be able to do what every mother wants to do…make her feel better. Don’t get me wrong there were some difficult questions to answer and some that would never have crossed my mind. Sometimes she wrote letters, in one of them she expressed that she was worried about my legs being weak (my muscles had wasted from the chemo and months spent in hospital), it’s surprising what was going on in her mind. Also she had been scared by my PICC line and the things she seen done to me in hospital so we talked about them and why I needed them to make me better. Another thing that bothers her is that I have my bloods checked every 8 weeks for the next 5 years…’it’s just such a long time away Mummy.’ she told me. We also found that letting her get involved with our fundraising helped, it gave her something to focus on as she spent quite a bit of time planning it. 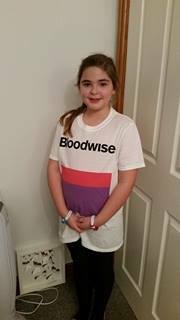 It was all her idea, I was really proud of her as she talked about me and Bloodwise in front of the whole school raising £165, it gave her a such a boost. She’s been involved in lots of things since. Time’s a great healer and things have improved…believe me at one time I was seriously worried. Like when she started sleeping with a picture of me and cry every single night I really did think we’d never get past it. Now I want to do my best to make her life a happy one, for her to experience lots different things and encourage her to have the confidence to try even if she fails. I am putting together a ‘hints and tips’ sheet which I will add to my blog shortly and I have more to write but I’ll have to do a separate post for that!